Purpose: Use this document as a reference for billing specific charges for a student in ctcLink. Enter a Business Unit and click the Search button. Enter an ID, Address Type, Billing ID, Due Date and Due Days. Scroll through the available bills using the arrows in the Account Info area. Select the check box next to each line item that you want to include on the student's bill. 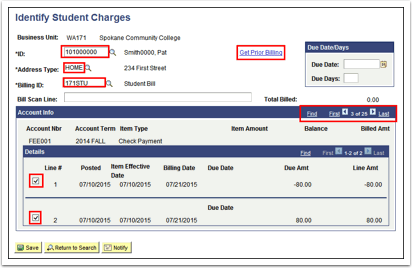 Click the Get Prior Billing link to access the Prior Billing page, where you can view information regarding past bills for this student. 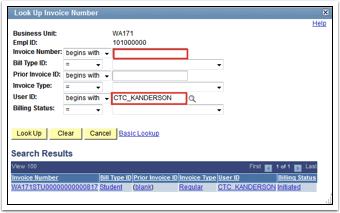 Select the Add a New Value tab to create a new Run Control ID or Find an Existing Value if this process has been previously run. To find the Invoice Number, search by the invoice number if known, or by the user ID of the person that created the invoice. Enter other parameters to narrow the search. The last invoice is the most recent. The Override Address Info check box affects only the printing of bills that the system already generated. If you select this check box, the process ignores the address already associated with the bills and selects addresses to print according to the order selected in the Address Usage field. Select the Address not required check box, ctcLink prints the bill even if the process finds no address. Select the Use Email Address check box if you send invoices by email. 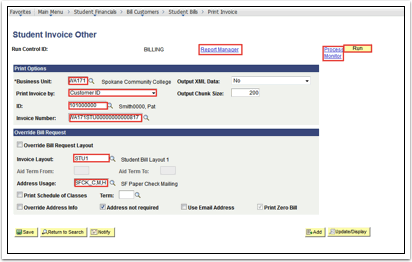 Select the Print Zero Bill check box to print zero balance bills. Click the Process Monitor link to ensure the process completes successfully. To view the .pdf files of the invoices, click the Reporting Manager link. Click the .pdf file to view and/or print.